What do the fastest growing firms in every industry do differently than their average growth competitors? This is the question that Lee Frederiksen and his team at Hinge Marketing seek to answer in their annual High Growth Study. 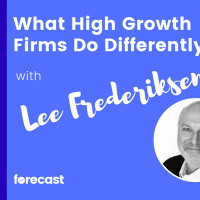 In this interview, Lee Frederiksen and John Tyreman share with us the findings from the 2018 High Growth Study, which involved over 1,000 firms with a combined annual revenue of more than $176 billion and marketing budgets totalling more than $20 billion. Is this the death of the generalist firm? Why do specialist firms grow faster? How much should firms be spending on marketing?